The following post was first published in 2011, yet it is definitely worth revisiting. If you have not read this post, what it depicts is a perfect example of why I call myself a “recovering legalist.” Even now I cringe when I recall my judgmental, legalistic actions 6 years ago. But God’s grace doesn’t force immediate change; we grow in grace. Getting Food = going to a restaurant that sells stuff you could make at home for a lot less money, but tastes better and is more fun when you pay for it in the company of others. Evening Services = gathering of believers at a local church that still takes place on Sunday nights, while most people stay home, in order to give the pastor something to do. Myself? Well I am in a suit and tie. My wife? She is wearing a dress. WE are the “Reverend and Mrs. Baker,” you know. WE know how to dress on Sunday, unlike these guys. So, my wife walks past them first and gives them a forced, but gentle smile. Next, I walk by, thinking to myself, “These are definitely musicians…yep…the hair gives it away…they’re the Prevost riders.” I nod and smile. 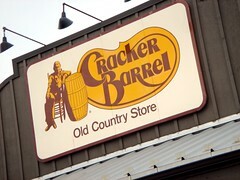 Once inside the Cracker Barrel, my conscience started to bother me. Something wasn’t right. I have been around long enough to recognize when the Holy Spirit says, “Hey, I bear witness that those weird-looking guys out there are part of the Family.” That is when I come up with a brilliant, self-covering plan – send Katie, our 15 year old, out to see who they are. I only had an old iPhone. And it was dark. “Katie,” I say, “go out there and ask those guys on the porch who they are or what band they’re with.” Fortunately, and I knew this, there were others outside beside the “men in black,” so don’t think I sent my little girl out to talk to strangers, alone. She talked to strangers with other strangers there to help. Now, here’s the point of all this. Here I am, someone who preaches against unrighteously judging others, especially Christians who look different (what’s normal?). What do I do? I walk right by a group of guys and assume, wrongfully, that evidently, just because they were not in suits on a Sunday night, they were a group of heathen beatniks heading to/from Nashville. I messed up. Sorry, guys, for doing the very thing I hate seeing other people do. This is why I call myself a “recovering legalist.” Sometimes I fail. Last night I failed in a bad way. Up until last night, I had never even seen you before to recognize you in person. All I know is that the song you recorded, “Always,” is one of my favorites…I’ve shed more than a few tears while listening to it. Please forgive my wife and I for acting like a couple of snobby, self-righteous, judgmental legalists. If I’m fortunate, maybe God will someday give this preacher some hair like yours. May God bless you and your ministry. He WILL be with you always. UPDATE: Shortly after this post was first published, Building 429 posted a link to it on their Facebook page. A little later we exchanged a few emails in which they graciously accepted my apology. I offered to buy them dinner the next time they came through town, but Jason Roy (lead singer) said that wouldn’t be necessary – then he offered me free tickets the next time they came to town! Cool, huh? But I never took him up on it – we just bought them, anyway. It was such an honor to take part in the Third Periodic Blogger Convention held in Chattanooga, TN! Actually, what really happened was that once again I got to meet up with fellow Christian bloggers and spend some time getting to know each other in the non-digital world. It was a total blast to talk face-to-face with these guys! Wally Fry (Truth in Palmyra) and his family left Arkansas and drove into Chattanooga Saturday night. He and I met for coffee before church on Sunday morning, then later attended church together. To my surprise, James Neff (Men of One Accord) and his wife also showed up for church! James visited a couple of times before, but this was the first time he and Wally had met. When the morning service was over, we did what any typical church-goer might do down here in the South – we went to Cracker Barrel. There we shared plates of biscuits, downed plenty of coffee, and shared more stories than a serial Facebooker. Wally Fry thought that we should get a picture together before all parted ways. Therefore, like proper husbands, we heeded the suggestion of our wives and sat down in the rocking chairs out front. And you know, even that seemed too fortuitous to be coincidence (but that’s another story). What I hope all of you take away from this story is that behind that computer screen, writing those blogs, are real people. Each one is part of a larger community where genuine friendships can develop. And when you actually get to see these people in person, it’s totally awesome! But here’s a thought that just came to mind. What do you think it will be like, after all those years of reading his letters…after all those years of communicating across vast distances…to see Jesus face-to-face? He’s real too, you know. Even more real than Wally, James, or myself. You might oughta be making plans to meet Him for dinner. The following took place 5 years ago in February, 2011. A lot has happened since then, but I’m still a “recovering” legalist – I still mess up from time to time. Now here’s the point of all this. Here I am, someone who preaches against unrighteously judging others, especially Christians who look different (what’s normal?). What do I do? I walk right by a group of guys and assume, wrongfully, that evidently, just because they were not in suits on a Sunday night, they were a group of heathen beatniks heading to/from Nashville. I messed up. Sorry, guys, for doing the very thing I hate seeing other people do. This is why I call myself a “recovering legalist.” Sometimes I fail. Last night I failed in a bad way. Up until last night, I had never even seen you before to recognize you in person. All I know is that the song you recorded, “Always,” is one of my favorite…I’ve shed more than a few tears while listening to it. Please forgive my wife and I for acting like a couple of snobby, self-righteous, judgmental legalists. If I’m fortunate, maybe God will give this preacher some hair like yours, someday. It has been a while since my last “Appetite” post. I have eaten since then, but the problem has been finding food worthy of comment. Fortunately, the search came to an end when I went to the Epicurean Restaurant in East Ridge, Tennessee. The last time I went to the Epicurean was back in the 80’s. 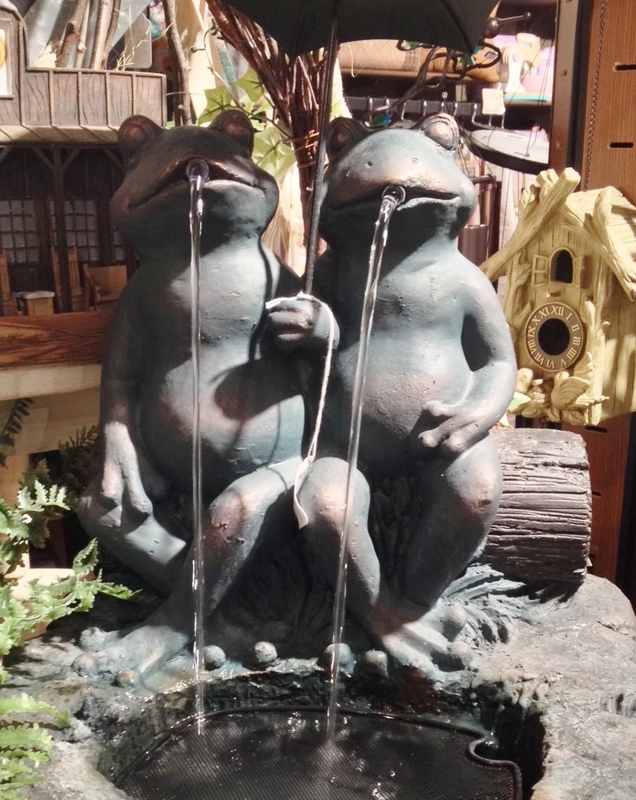 Trying to impress a girlfriend, I took her to a place that had a reputation for quality food and excellent service (Frankly, I also heard it was expensive, and girlfriends like expensive). This time we went for a birthday dinner, and the prices were not as bad as I remembered. They say that one mark of a good restaurant is how many cars are in the parking lot. If that is true, the Epicurean is a GREAT place to eat. When my family and I got there at 2pm on Sunday, the parking lot and dining area were packed……with seniors…..the aged….walkers & canes. How does that factor in, I wonder? Isn’t it true that the older one gets, the fewer active taste buds? Hmmm. Every once in a while I feel the urge to try something TOTALLY new. I have even found myself eating things that were hard to identify. This dish, however, was something that was new to me on every level. 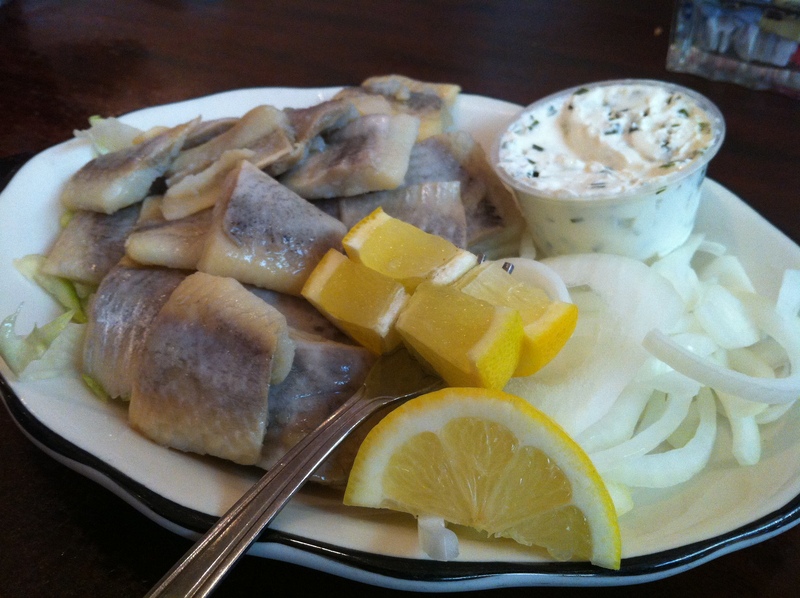 According to the experts in the culinary arts, marinated herring (aka, pickled herring, etc.) is a delicacy in Europe, and the Epicurean Restaurant IS a Greek-family-owned establishment. I figured it was time to taste the delicacy the Europeans raved about. Did I ever say that I was NOT European? Aside from cottage cheese, there are not many things that will cause my gag reflexes to act up. I don’t do raw fish, for the first thing. I can’t even stomach fake sushi. What on earth made me think I could eat this stuff? Well, for one thing I didn’t really understand how it was made. You see, I thought they took a fish, marinated it in some “stuff,” then cooked it. WRONG! The herring is actually rinsed, then marinated for a couple of days, then sliced up for easier human consumption. It is served cold over a bed of lettuce, with chopped onion, lemon, and dill-flavored sour cream on the side. Let me brag about this – I ate four bites, maybe five. The last one, however, was the hardest to get down. The strong fish taste, coupled with the flavors of dill, white wine, and onion was too much. I brought home the rest in a take-home container for the neighborhood cat that seems to have made our front porch one of his stops. That must have been the first time I saw a cat gag. A large, gray cat looking at you with suspicion and contempt, his vertical pupils turning horizontal to line up with the evil squint he is giving. Well, after a few hours went by, the lingering taste of cold, raw, meaty, oily herring finally dissipated. Some foods are definitely an aquired taste. On the other hand, some might be better left alone, especially if you don’t want your leftovers creating a Stephen King / Pet Cemetery moment right in your own yard. Getting Food = going to a resturant that sells stuff you could make at home for a lot less money, but tastes better and is more fun when you pay for it in the company of others.